← Mark Ronson Bang Bang Bang Lyrics: Shake it Cinderella? The Big Debate: How Long Should I Brush My Teeth? Okay, back to my point. I keep arguing with my family members about the length of time one should spend brushing teeth. I am often told that I spend too long brushing my teeth, but I never cease to remind the accuser of the recommended brushing time – a MINIMUM of two minutes. I’ve done my research, it’s not one minute – it’s two! Interestingly, the Academy for General Dentistry website states that most people brush their teeth for less than a minute. I think it’s because we underestimate how long two minutes can feel. When I was a little girl, my mom bought me a Minnie Mouse toothbrush holder that had a two-minute sand timer attached to it. It was great, all I had to do was flick the timer and watch as the sand trickled through to the other side. Perhaps that’s a good way of finding out whether you are brushing your teeth for the right amount of time – take the sand timer out of your Pictionary or 30 seconds board game set and use it to gauge whether you are reaching the two minute target. A bit on the boring side? Why don’t you try humming one of your favorite two minute songs or listening to one on your iPod while you brush. You might even find that one becomes your standard teeth brushing song. There are other factors to consider when it comes to good dental care, you can read more here, but I really just wanted this post to put the length of time issue to rest. 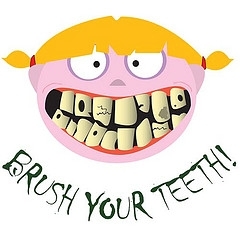 Brush your pearly whites for two minutes twice a day to ensure that they remain in good condition. This entry was posted in Uncategorized and tagged dental care, health, lifestyle, teeth, time, two minutes. Bookmark the permalink.